Campaign to benefit Lincoln Park Community Services, which helps individuals facing homelessness change their lives. 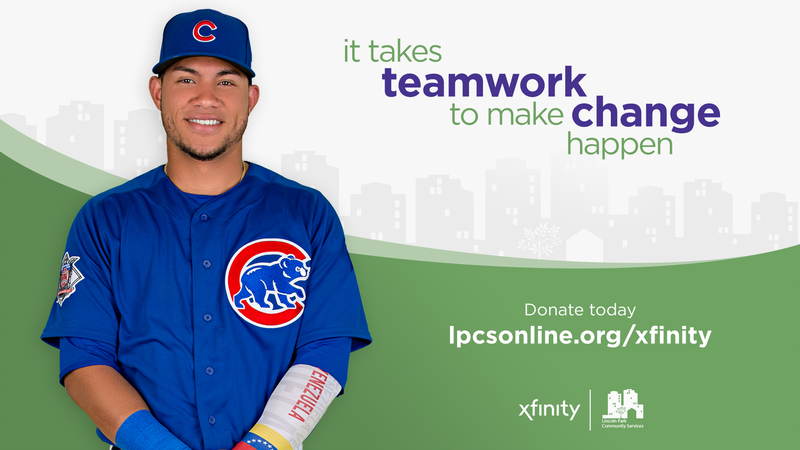 August 27, 2018 – All-Star catcher Willson Contreras will join Xfinity and the Chicago Cubs during today’s game to announce a campaign to support Lincoln Park Community Services (LPCS), a community-based organization that provides secure and stable housing for individuals experiencing homelessness, along with services designed to help them change their lives. LPCS, which first opened its doors in 1985, is developing a new facility at 1521 N. Sedgwick St. in Chicago. The new facility will allow the organization to broaden its programs and services, increase its visibility in the community, grow its interim housing capacity and provide permanent supportive housing apartments on site – a first for the organization. Xfinity is funding an “Xfinity Experience Lab” in the facility, which will allow LPCS and other community-based organizations to deliver programs and services, ranging from workforce and digital skills training to lifelong learning programs – in an environment offering access to innovative technology and the internet. Willson is asking fans to join in the campaign and donate directly to LPCS by visiting https://comca.st/2MWCaWy. 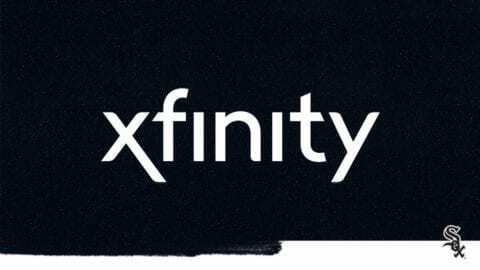 Xfinity is part of Comcast, whose No. 1 community investment goal is to close the digital divide. 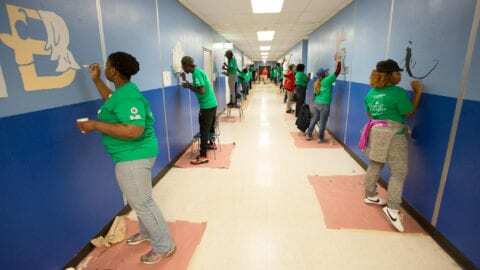 To that end, the company’s Internet Essentials program is the nation’s largest and most comprehensive high-speed Internet adoption program for low-income Americans. The program has helped six million Americans – more than 660,000 Illinoisans – gain access to the internet at home, many for the first time. For more information or to donate to LPCS, visit https://comca.st/2MWCaWy. LPCS brings communities together to empower individuals facing homelessness and poverty to secure stable housing and make sustainable life changes. LPCS provides a holistic continuum of services that removes barriers and increases self-sufficiency. LPCS is primarily privately funded, supported largely by community donations. Truly a community-based organization, LPCS has always been operated by a pool of more than 2,500 volunteers each year. Internet Essentials from Comcast is the nation’s largest and most comprehensive high-speed Internet adoption program for low-income Americans. It provides low-cost high-speed Internet service for $9.95 a month plus tax; the option to purchase an Internet-ready computer for under $150; and multiple options to access free digital literacy training in print, online and in person. For more information, or to apply for the program, visit https://comca.st/2MQchHV or call 1-855-846-8376. Spanish-only speakers should call 1-855-765-6995. Comcast Corporation (Nasdaq: CMCSA) is a global media and technology company with two primary businesses, Comcast Cable and NBCUniversal. Comcast Cable is one of the nation’s largest video, high-speed Internet and phone provider to residential customers under the Xfinity brand and also provides these services to businesses. NBCUniversal operates news, entertainment and sports cable networks, the NBC and Telemundo broadcast networks, television production operations, television station groups, Universal Pictures and Universal Parks and Resorts. https://comca.st/2MQ9uhX for more information. 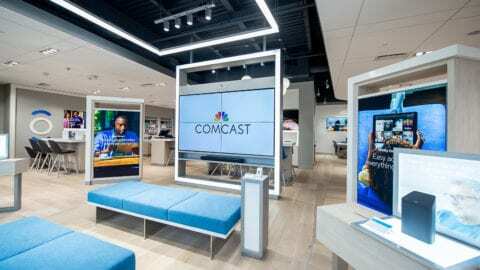 With around 6,500 local employees, Comcast’s Greater Chicago Region (https://comca.st/2MWI6i0) serves customers in central and northern Illinois, including the Chicago area, northwest Indiana and southwest Michigan. “Like” Comcast’s Greater Chicago Region on Facebook by visiting @Comcast. “Follow” Comcast’s Greater Chicago Region on Twitter at @ComcastILLINOIS.